Tourism, particularly international tourism, plays a tremendous role in sustaining our economy — a role that President Obama highlighted in a recent speech in Cooperstown, N.Y., where he cited the $1.5 trillion in total economic activity resulting from travel and tourism in 2013. Get caught up from the past week with U.S. Travel's President and CEO Roger Dow. 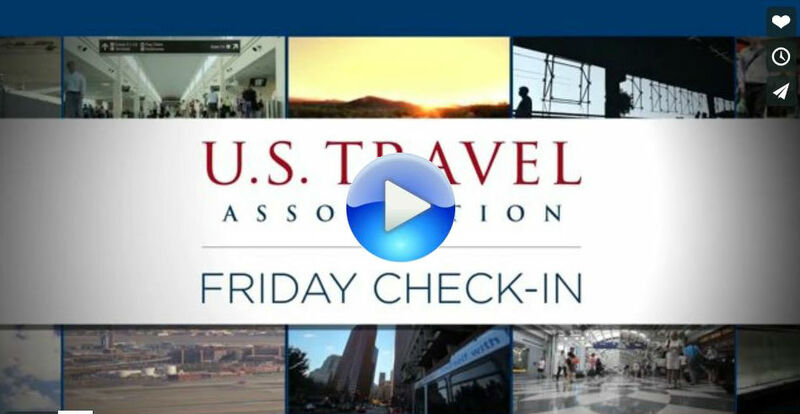 Watch as he highlights the recent exciting travel news and updates in Washington. Travel industry employment achieved another record high last month, according to U.S. Travel, adding 6,500 direct jobs in July and totaling 63,800 jobs for the first seven months of 2014. If you've grown accustomed to being waved through the PreCheck security lanes at the airport without having paid to enroll in the popular program, time is running out. Tall Ships in Los Angeles! "It's crucial that we continue to advocate for Brand USA. It's critical that we have a seat at the table," said U.S. Travel Senior Director of National Council Relations Nan Marchand Beauvois. Whether you’re planning a VIP dinner or a national convention, Hilton Worldwide Meetings & Events has the perfect place for your organization in our 11-brand portfolio. With 4,100 hotels around the globe and online, you can find room specifications, submit RFPs and earn rewards, and all perfectly executed. "Before Widen, many of our images were stored on our local server making it hard to distribute to people. Widen DAM has given us a better way to share images with partners and media who are requesting images for their own publications." We Americans work hard. Weekends are more like workends. We sleep with our smartphones. And we think vacations are for wimps. So we don't take them. Or take work along with us if we do. The U.S. is the only advanced economy with no guaranteed minimum vacation time, with one in four working Americans having no paid time off at all. Miami's loss is New Orleans' gain as the Crescent City is stepping in to host the largest travel industry trade show in North America. Is Congress even trying to fix the right problem? Has anyone actually asked consumers what's most important to them when it comes to air travel? The U.S. Travel Association did. The results are surprising. Arne Sorenson will soon join 200 CEOs from the U.S. and Africa, nearly 50 African leaders and President Obama in Washington to discuss global investment in Africa. It's vacation season, and for many politicians, both on and off the ballot this year, that means careful calculations about whether to take time off, how much time to take and where to go. It's tough to fit your story in a banner ad. Sponsored content lets travelers discover you on their own terms. Here's how. A short-term fix for the nearly empty Highway Trust Fund is a step closer to President Obama's desk. Congress has been talking about the long-term problems with the construction account, but the two chambers have not agreed on a long-term solution. Floor space for IPW 2015 is selling fast! IPW Orlando, May 30-June 3, is certain to sell out. Register now to lock in early savings and receive priority appointment scheduling.What's the benefit of waiting 'til the last minute? Contact Krista Roepke with questions.